Dayton Inflatables is proud to offer Inflatable Dry Slide Rentals in Dayton, Springboro, Kettering and the surroundingcommunities. Our slides will have your guests entertained from start to finish. Our great inflatable rentals are sure to be the centerpiece at your next part or event. What makes our inflatable dry slides the perfect fit is that they can be set up indoors or outdoors. Our inflatable slides are perfect for kids and adults alike. Also, nobody likes waiting in line, so a slide is the perfect choice. An inflatable slide rental from Dayton Inflatables provides a great throughput, so there is a constant flow of participants. Our inflatable dry slides would be a great addition for birthday parties, company picnics, family reunions, school field day, festival, or fundraiser. 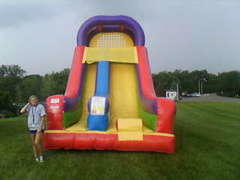 Our 18' Giant Slide is perfect for smaller children; however, adults enjoy this one as well. You can rest easy knowing that all of our equipment is manufactured for not only fun, but safety as well. All items are made by the top companies in the world and every single one of our units meets or exceeds industry safety standards. When it comes to the best selection of inflatable dry slide rentals in Dayton, Springbor, Kettering and the surrounding areas, nobody comes close to Dayton Inflatables with selection and service. We proudly serve Dayton, Springboro, Kettering and other surrounding areas. Our inflatables will have your party jumping. Browse the selections below and click the image or title for more information and to request a quote. We welcome all questions, so please contact us for inquires and orders.